Feb 07- GEFONT has organised Special Campaign in Eastern Region to organise the Bank, Cooperative, Finnace, Micro Finance and Bima Company workers to form the National Federation of those workers. Under the coordination of GEFONT Secretary Dinesh Rai, one team has been organising various gatherings in Eastern Region. In Morang Six gatherings have been completed with the participation of around one thousand workers of Bank, Cooperative, Finance, and Micro Finance Sectors. Likewise, two gatherings have been completed in Sunsari with around 400 workers. During the Gathering Secretary Dinesh Rai, social security as well as problems of workers in Bank & Finance sectors. GEFONT Bagmati Zonal President Ram Hari Nepal, GEFONT Youth Committee President Damodar Sapkota and UNITRAV General Secretary were mobilized for the Campaign. 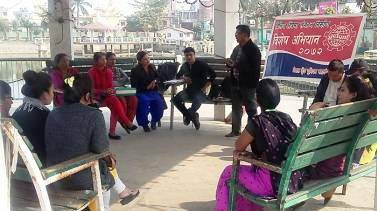 GEFONT organisational mobilization & membership recruitment campaign was launched on Jan 31 2016 from Kathmandu and aimed to conduct in various parts of Eastern Region and will end reaching the Western rn Region. Afterward organising the Wider Conference, GEFONT will establish the National Federation of Bank and Finance sectors workers.